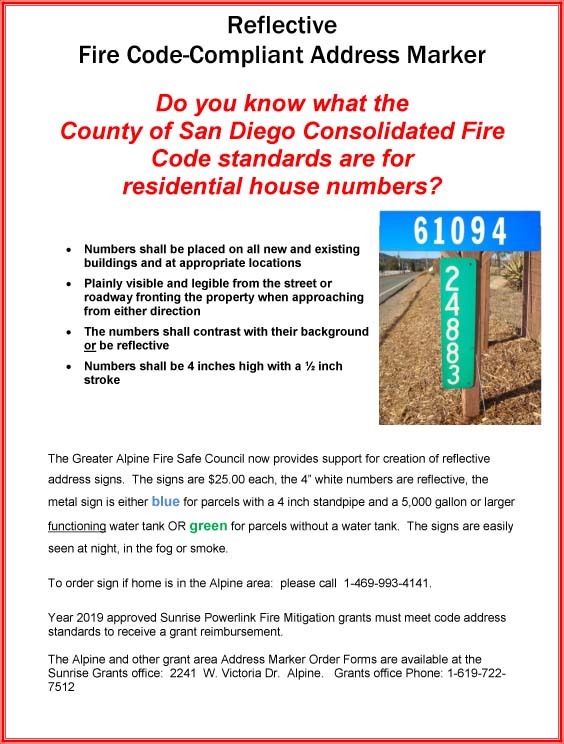 Do you know what the County of San Diego Consolidated Fire Code standards are for residential house numbers? The Greater Alpine Fire Safe Council now provides support for creation of reflective address signs. The signs are $25.00 each, the 4” white numbers are reflective, the metal sign is either blue for parcels with a 4 inch standpipe and a 5,000 gallon or larger functioning water tank OR green for parcels without a water tank. The signs are easily seen at night, in the fog or smoke. 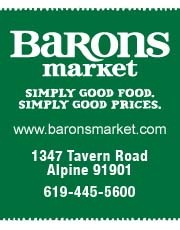 To order sign if home is in the Alpine area: please call 1-469-993-4141. 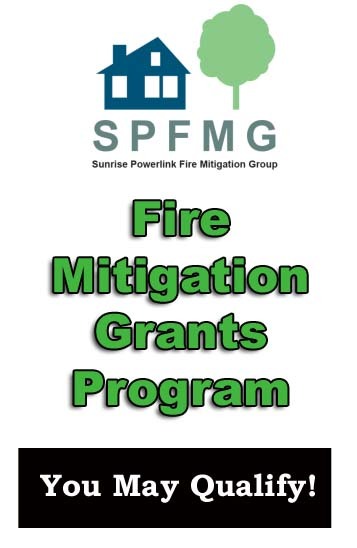 Year 2019 approved Sunrise Powerlink Fire Mitigation grants must meet code address standards to receive a grant reimbursement. Grants are available to eligible parcels to assist homeowners for the creation of defensible space or for approved residential structure hardening improvements. 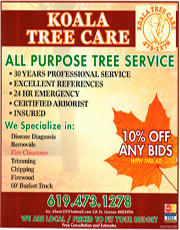 Defensible Space Grants – 100 feet around habitable structures and 20 feet along both sides of driveways and roadways that bound your property. Structure Hardening Grants– Harden habitable structures by retrofit with approved materials; roof, windows, skylights, exterior doors, patio covers, decks. 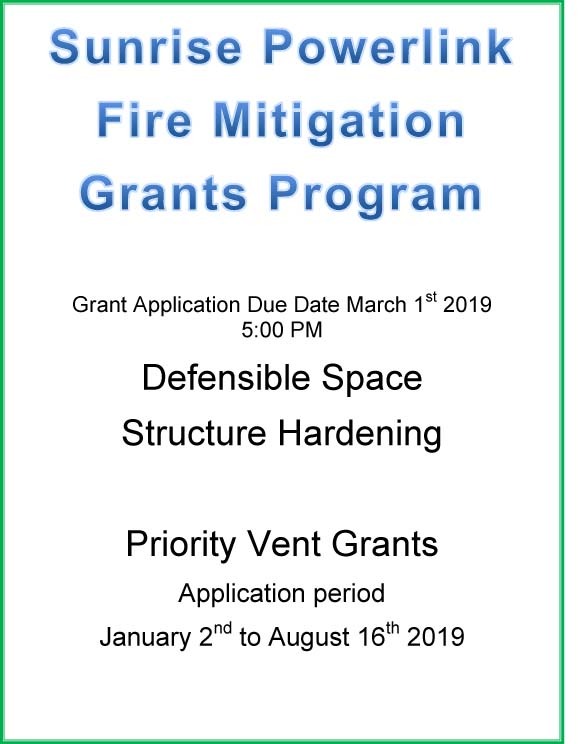 March 1, 2019 5:00 PM is due date for a Defensible Space or Structure Hardening grant application. Priority Vent Grants – During a wildfire most homes are destroyed by windblown embers entering the home. Newly designed vents provide ventilation while trapping flames and embers BEFORE they enter the home. Priority Vent Grants approved within seven days of Grants office receipt of complete application which contains a quote for code compliant vents. Grant awards to quote amount up to maximum of $2,327.06. 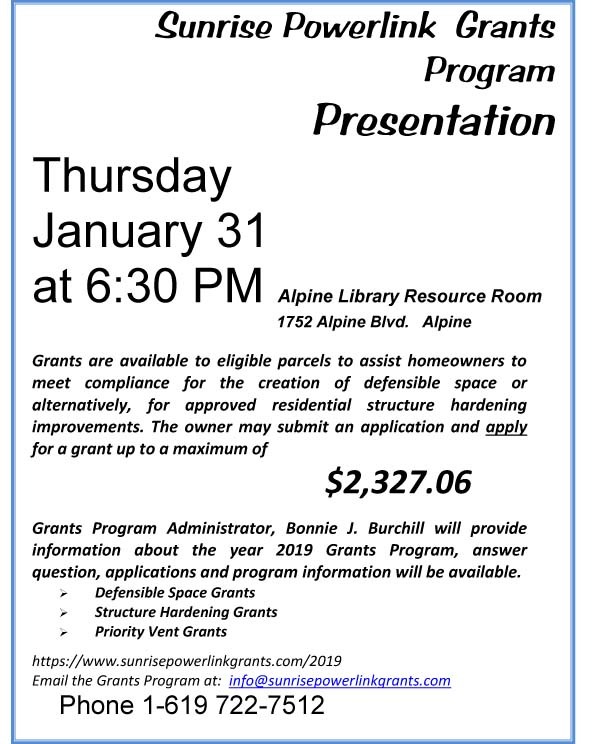 The Sunrise Powerlink Fire Mitigation Grants Program Administrator, Bonnie J. Burchill will provide information about the Year 2019 Grants program at 6:30 pm on Thursday, January 31, 2019 at the Alpine Library Resource Room located at 1752 Alpine Blvd, Alpine. Information about the program will be provided, answer questions, applications will be available. Grants are available to eligible parcels to assist homeowners to meet compliance for the creation of Defensible Space or alternatively, for approved residential Structure Hardening improvements. 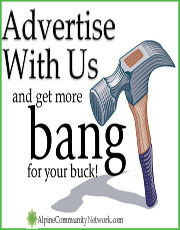 The owner may submit an application and apply for a grant up to a maximum of $2,327.06. Priority Vent Grants – Replace vents with new ember intrusion design. Old vents replaced with new fire code compliant design will keep embers OUT and Harden the home. 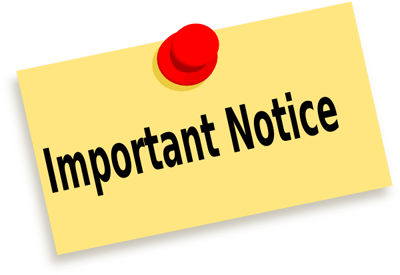 Priority vent grant awards are made up to the estimate/quotation up to maximum of $2,327.06. 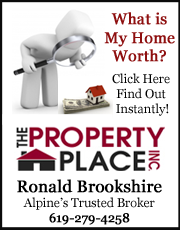 $2,278.30 SUNRISE POWERLINK GRANT: Your Property May Be Eligible! 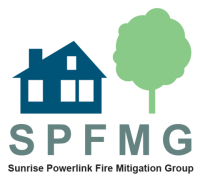 Fire Mitigation Grants Program Grants are available to eligible parcels to assist homeowners for the creation of defensible space or for approved residential structure hardening improvements. However, last year, the grant ran out of funds early. If you are interested, be sure and put in your application ASAP! If you are the owner of an eligible property, you may submit a completed application and apply for a grant up to a maximum of $2,278.30. SAN DIEGO, CA (February 29, 2016) – The Viejas Band of Kumeyaay Indians recently pledged $5,000 to the Alpine Education Foundation to fund an electromagnetic field (EMF) study of Sunrise Powerlink high voltage lines buried near Alpine Elementary School. In response to elevated EMF levels measured near the school, the Alpine Community has raised concerns regarding possible health risks to local children. High EMF levels have potential links to leukemia and other serious health issues. The study will measure between 15 and 20 separate locations on the property and in classrooms. 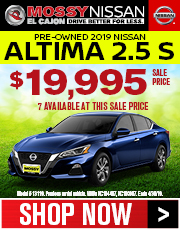 “We share in our community’s concerns over this issue and we appreciate the steps that the Alpine Education Foundation is taking to support the families of Alpine,” commented Viejas Tribal Chairman Robert Welch. For more information, visit www.viejasbandofkumeyaay.org. We finally have the attention of the California Public Utilities Commission on the issue of electromagnetic field levels in Alpine, but the agency’s initial response falls far short of what must be done. 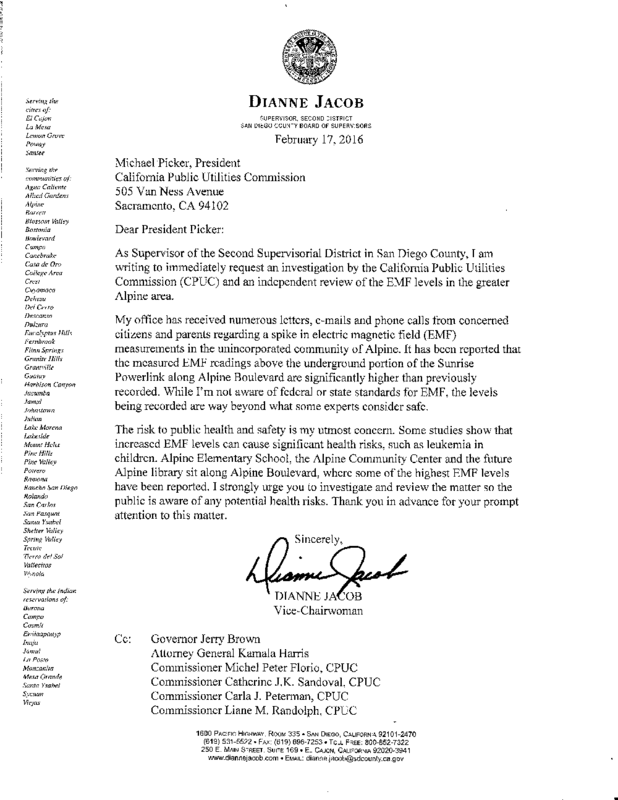 In a brief letter received by my office late yesterday, CPUC President Michael Picker promises to “further investigate the matter.” Recent reports of high EMF levels along SDG&E’s Sunrise Powerlink through Alpine must be addressed immediately or the utility company should shut down the line until they are resolved. The CPUC letter fails to include a timeline for an investigation and makes no assurances there will be an independent review of the results. Instead, Picker says he will alert SDG&E and encourage them to work with me. 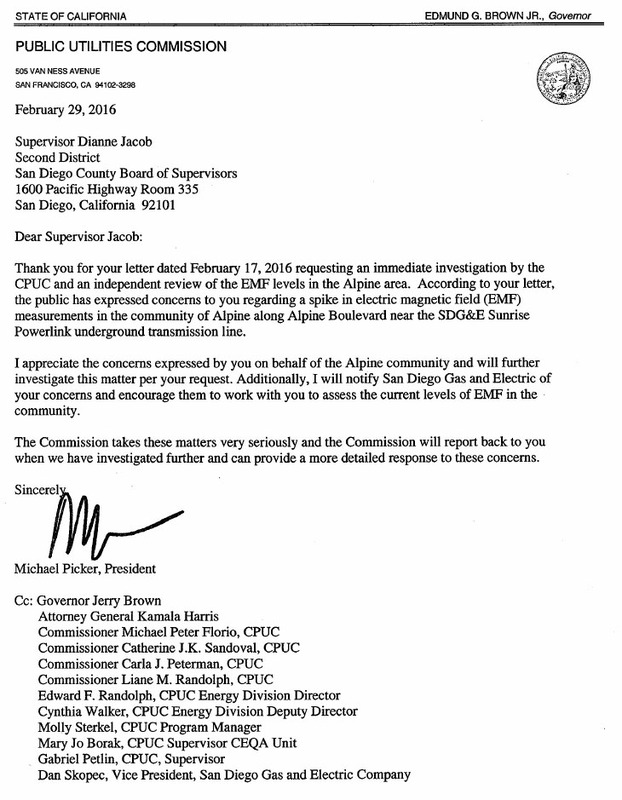 Does that mean state regulators want SDG&E to help lead an investigation? Terrible idea. The utility can’t be trusted and has zero credibility in our community, especially since the construction of Sunrise Powerlink. The CPUC should also make sure SDG&E is not manipulating the level of power running through line in an attempt to alter EMF readings. 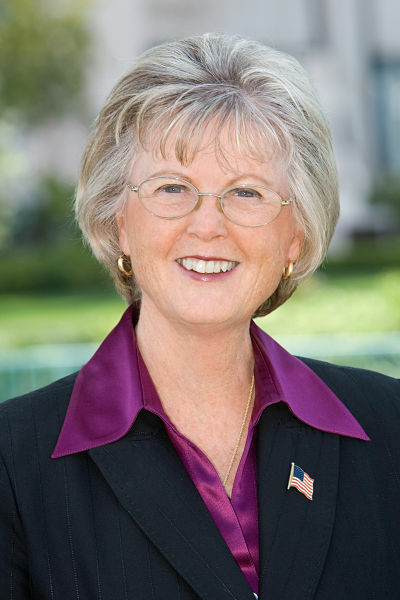 I’m writing the CPUC back and asking for details and clarification. Please Click HERE SDCO-01 Alpine EMF Rpt AES 2 2016 to view the second EMF levels report for Alpine Elementary School that was completed on February 26, 2016. Alpine Education Foundation (AEF) to Fund Independent EMF Studies at Community Locations Near Alpine Blvd. February 25, 2016 – Who makes up AEF? We are both parents of children in AUSD and directors of a foundation committed to supporting all children in AUSD. We firmly believe it is important that our children learn in a safe environment. As you may have heard, it has been recently discovered that the SDGE Powerlink line running down Alpine Blvd. may have contributed to increased levels of EMF (electromagnetic fields). The AEF Board of Directors has voted to hire a firm to run EMF testing at all AUSD campuses, as well as various community locations. 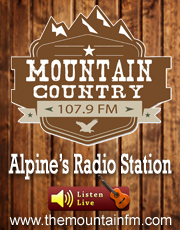 Our goal in doing so is to allow the parents of Alpine to make an informed decision by having access to the best data available at similar locations. A community forum will then be held to discuss the results and what they may mean. The firm will also leave a data collector to monitor results for 2 weeks at AES. If the results indicate a problem, we will immediately work with the District to put our kids in a safe place. If the results are good, we join the rest of the community in the relief of knowing our kids are safe. AEF is a non-profit, all-volunteer organization dedicated to helping our schools and kids. In our five years of existence, we have given our schools over $200,000 and our annual contributions continue to grow year after year. The expenditure of EMF testing will be wholly paid for by AEF. 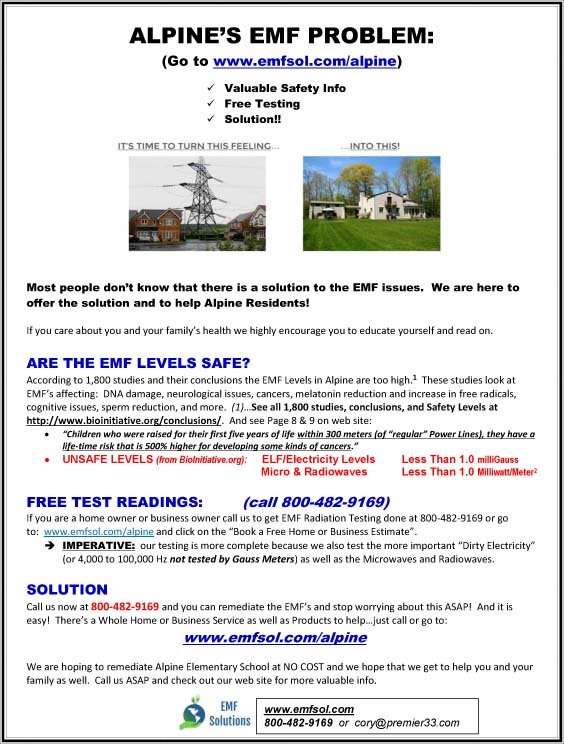 If you would like to join us and help financially support the EMF testing, you can make a directed donation at http://aef4kids.net/donation/?cause_id=0. Please specify “EMF” in the comments field. This will help replenish funds that would be otherwise directed to classroom learning supplies and programs. 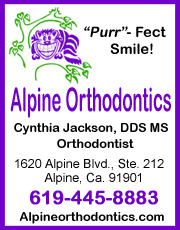 We thank you for your continued support of the children of Alpine.